Bird and Squirrel… and Cat! Animator James Burks (who previously gave us Gabby & Gator from Yen Press) returns with Bird & Squirrel Volume 1: On the Run, a new full-color graphic novel from Graphix Press. 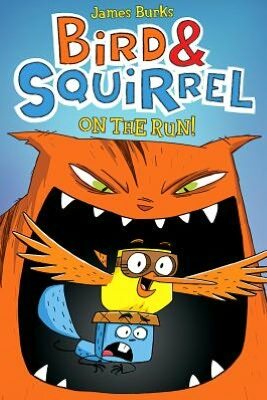 “Bird and Squirrel outwit Cat and become best friends in this zany adventure. Squirrel is afraid of his own shadow. Bird doesn’t have a care in the world. And Cat wants to eat Bird and Squirrel. Of course, he’ll have to catch them first, and that’s not going to be easy. Join this trio as they head south for the winter in a hilarious road trip. But watch out! Cat is waiting around every bend, and he’s one pesky feline.” Barnes & Noble have pre-order information for the book, which is coming this August.